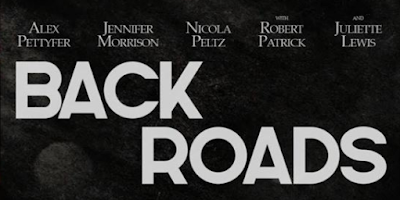 Read Will's review of Back Roads. After his mother, (a gritty Juliette Lewis), is imprisoned for killing his abusive father, Harley Altmyer (Alex Pettyfer) is left to care for his three younger sisters in rural Pennsylvania. Harley forgoes his college education, working dead-end jobs to pay the bills and raise his siblings, including his rebellious and promiscuous 16-year-old sister, Amber (Nicola Peltz). Scarred by his past, Harley becomes infatuated with Callie Mercer (Jennifer Morrison) the older married woman who lives nearby. Things take a dangerous turn when they embark on an affair and shocking family secrets soon begin to emerge. As Harley’s life spirals out of control, unspoken truths leading to a devastating conclusion come to the surface and threaten to consume him. Back Roads is in select theaters on December 7th, 2018. Alex Pettyfer proves he has a talent both in front and behind the camera. 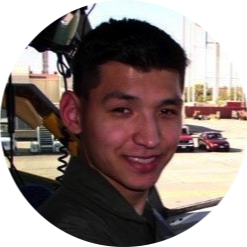 In his director debut, he brings to focus a grim life with a keen eye for tense drama. This is dark, claustrophobic, and intense all the way through. The movie is based on a novel written by Tawni Odell which is set in rural Pennsylvania and it’s about a fractured family. 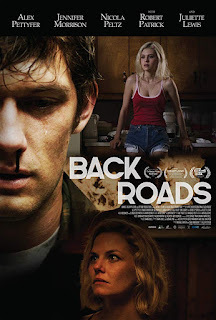 'Back Roads' is centered around Harley Altmyer (Pettyfer), who's failing miserably to care for his three younger sisters when is mother Bonnie (Juliette Lewis) is in prison for murdering their father. Harley passes up college and now works nights in a local grocery store. He has a lot on his plate especially with his 16-year-old sister Amber (Nicola Peltz), who is promiscuous and rebellious. Misty (Chiara Aurelia) is detached and distant while Jody (Hala Finley), the youngest is holding a family secret. Callie Mercer (Jennifer Morrison), a married woman, 10 years older tries to befriend Harley as she notices his struggling life and now he can't stop thinking about her. Attempting to fill the emotional void in his life, he begins a passionate affair. Callie is thrilled by the attention of the younger man, but soon becomes unsure of what she got herself into. Pettyfer's lead role is subtle and upsetting, as is Morrison's performance. Peltz, Aurelia, and Finley - shine in their intensely moving roles, too. Lewis like usual, offers a memorable character, even if she's only onscreen for a couple of scenes. Above all, Pettyfer's movie is a dark drama with a few twists and he deserves credit for both his performance and controlling the tone as a director. It was the strongest during the affair scenes. It also showcases the dangerous cycles small town families can end up in and how it can tear a family apart when dark secrets are revealved.